You have heard it on repeat in school, and have taken several classes on how to build a research question and how to research your questions. 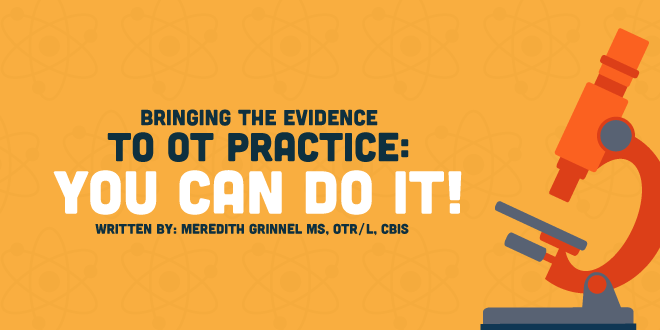 But how do you bring the evidence to OT practice? So now you are about to step into a clinical position, or have been there for a brief amount of time. Where to begin? Here are a few opportunities I have come across to bring evidence to OT practice that have helped me merge clinical skills and evidence-based practice. First, make sure you are registered and have an account with NBCOT. Second, log on and access their “My NBCOT” page linked here. NBCOT has been working hard to assist practitioners in continuing education. Through this site you can manage courses, research continuing education courses, take mini quizzes on practice areas, problem solve through case studies, build splints, and more. This may sound like a plug for NBCOT because it is, you should really use it. AOTA publishes AJOT (the American Journal of Occupational Therapy), but as a member, you also get access to the Canadian Journal, as well as the British Journal of Occupational Therapy. That’s three for one! Don’t forget about your mentors and coworkers. If you are presented with a diagnosis you are not familiar with, or want to try a new technique, your peers are a great source of information, and are usually willing to help. Remember that clinical experience and expertise are both forms of evidence-based care. The solution discussed is just one piece of the decision tree you can pull together to make a strong argument for your practice. Don’t forget about students, you were there once! Students working in your clinic have access to their schools’ database. It makes a great student assignment to bring in several articles about a topic you are interested in. They learn. You learn. Everyone wins. So the question becomes, when do you have time to do the research needed to help answer your question? You need to find the balance in your schedule. Do you have time during the day at work or do you only have time after work? The ongoing battle with work/life balance does not end once you graduate. You have chosen a field where information is constantly evolving and you need to keep up with it. Bring those time management skills with you. Set aside time, daily or weekly, to allow for research and writing. Pick a topic for the week and see what is in journals and research. One common practice to discussing new articles, techniques, and evidence-based practice in clinical practice is through a journal club or a “brown bag lunch." One lunch period a month is spent with peers discussing a topic or article. There are many ways this can be set up and each facility will have their own twist. In my experience, this has been a hard strategy to keep. Clinicians are already trying to keep up with productivity demands, not mention the multitude of other meetings that happen during lunch, so it’s easy to understand why a journal club is the first thing to drop. However, don’t give up. Some programs really support this method of ongoing education, devoting the resources needed for it to be successful. Trying a new technique or tool with a patient can be intimidating and is one of the reasons people are resistant to change or try. I have learned to be honest and transparent with patients. Use this as an opportunity to teach them about their plan of care, goals, and how your skills can impact their outcomes. I have found patients to be receptive to a “confident honesty.” Admit that you are still learning but portray that you have a sound understanding of the basics. This will also be a chance to figure out appropriate uses of resources. It is your responsibility to be practical and ethical with the use of materials and funding. These are just a few ideas that can help you get started in bringing the evidence to OT practice in clinical settings. You have worked hard to build these skills, and now is the time to use them. If you are ever interested in wondering how a new grad OT can enter the research field, look no further.